If you are in the United States of America (USA) Amazon.com has a special iPhone trade-in program currently in operation offering special prices on iPhone trade-ins. Q. When is the iPhone X European launch dates? A. The iPhone X was announced on the 12th September 2017 with pre-orders on 27th October 2017 and they will start shipping on the 3rd November 2017 (in initial countries including the United Kingdom). A. There is only one size of iPhone X (5.8" diagonal screen). Q. What are the primary new/upgraded features of the iPhone X compared to the older models? See Apple UK's comparison chart for a full feature by feature comparison. Q. Is the iPhone X splash, water, and dust resistant? A. Yes, rated IP67 under IEC standard 60529. Q. Does the iPhone X come with a 3.5mm headphone jack? Q. What colours is the iPhone X available in? A. Space gray and silver. Q. What storage capacities is the iPhone X available in? Q. What are the system requirements for using an iPhone X? Q. I'm not running OS X 10.10.5 or later. What can I do? A. Check to see if you can upgrade to OS X 10.10.5 or later. Q. iPhone X supports 4G/LTE in other countries outside of the USA. Can I take advantage of this in Europe? Q. What mobile frequencies does the iPhone X support? A. The iPhone X supports 23+ LTE/4G bands including those used in Europe. Q. Does Apple have their own wireless charger? A. Not yet. 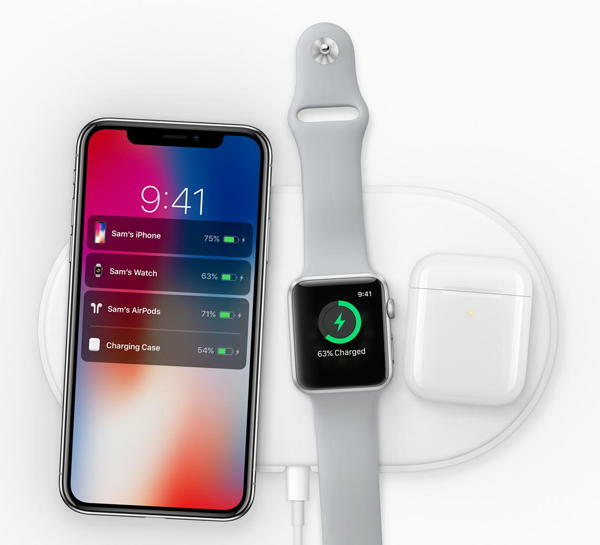 On the 12th September 2017 Apple announced the "AirPower" wireless charging mat that can charge an iPhone, Apple Watch and optional wireless charging AirPods case, all at the same time! Q. Do I have to use Apple's own wireless charger? Q. Can you tell me more about Face ID? A. We've moved our FAQ regarding Face ID to its own separate article. Q. The iPhone X only comes with a "Lightning" connector and no 3.5mm audio out socket - can I still use older headphones/earbuds/audio devices that have 3.5mm connector? A. Yes. The iPhone X comes with a Lightning to 3.5mm audio connector adaptor in the box which allows you to still connect older headphones/earbuds/audio devices to the iPhone X - however, you cannot use an older audio device and charge the iPhone via cable at the same time. Q. The iPhone X comes with a "Lightning" connector. Can I still connect it to my computer/older devices? NOTE: The Lightning to 30-pin Adapter is not compatible with everything. Apple states "This adapter lets you connect devices with a Lightning connector to many of your 30-pin accessories. Support for analog audio output, USB audio, as well as syncing and charging. Video output not supported." Q. Are older models of iPhone still available to buy? Q. Do Animojis work with third party apps? A. No - currently it is Apple's iMessage only. Q. What version of iOS does the iPhone X come with? A. It comes with iOS 11 and also includes the following apps free: Photos, iMovie, Pages, Numbers, Keynote and Garageband. Q. I don't want iOS 11. Can I install/run an earlier version of iOS?